« From My Grand Bahama Garden: RED Avocados! The color BLUE dazzles in The Bahamas. 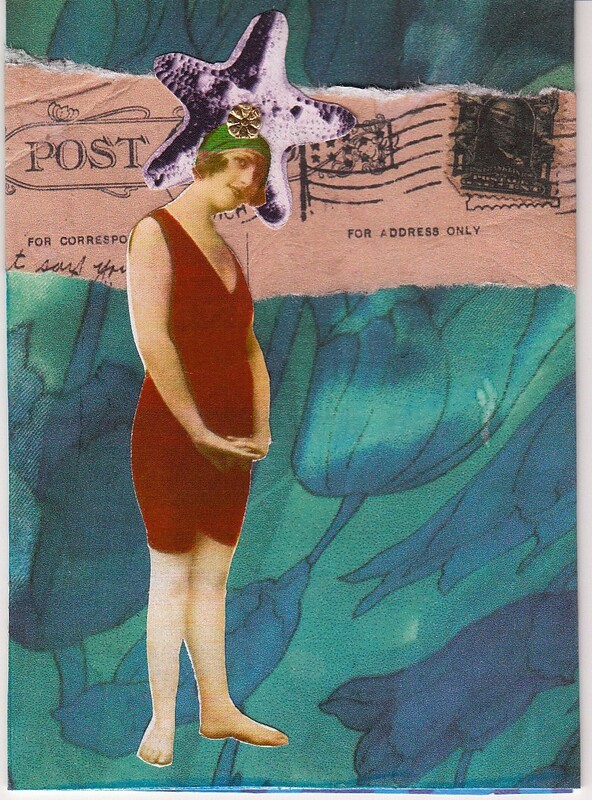 Countless variegated shades of aqua, cyan, cerulean, azure, sky, royal, indigo, and sapphire surround us in the shifting seas and are celebrated in all kinds of art—including these artist trading card collages I created for the blue-themed ARTchix challenge. 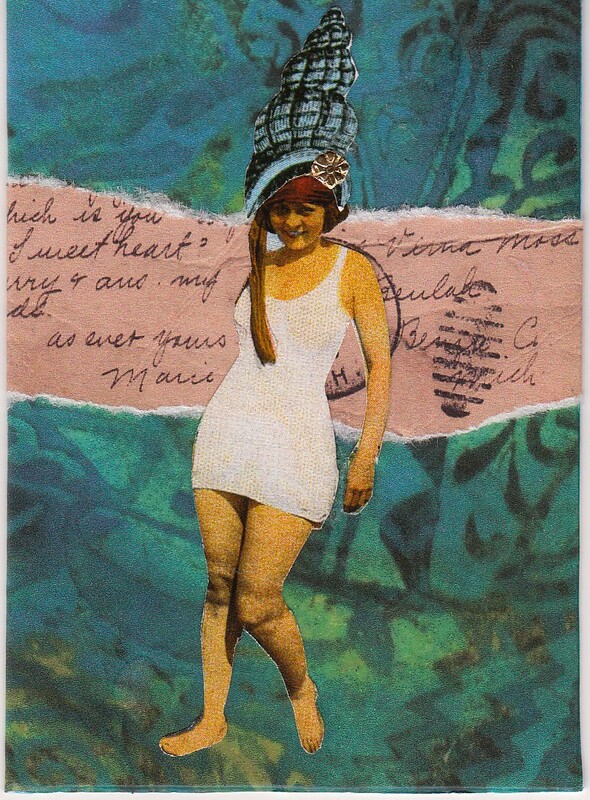 I loved making these vintage Bathing Beauty mixed media collages. 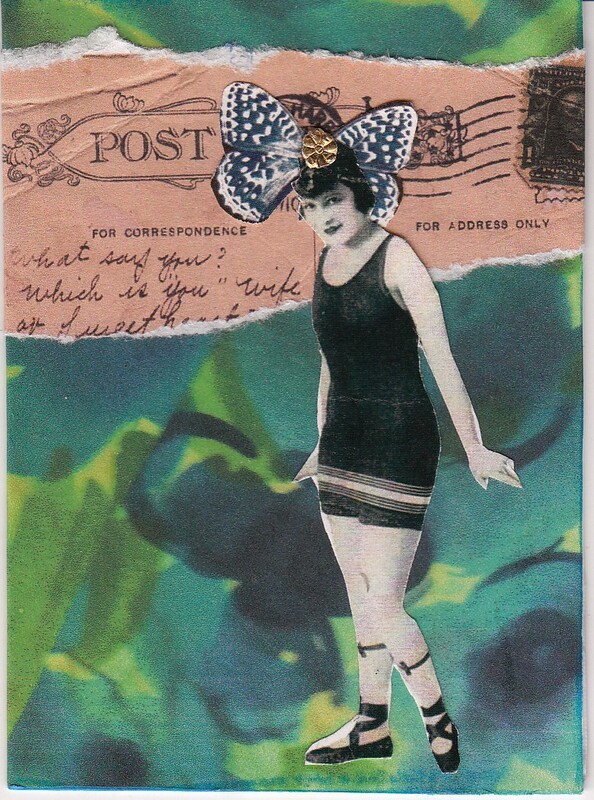 The backgrounds came from photos of tropical-water-hued fabric prints in my fashion wardrobe, photographed and printed onto paper, then layered with some retro-fun ARTchix Studio images and historic postcard text. I love splashing into waves of blue and frollicking in art. This entry was posted on May 30, 2011 at 10:06 pm and is filed under art, by the sea, collage, design, favorite things, Grand Bahama Island, inspiration, intriguing images, The Bahamas. You can subscribe via RSS 2.0 feed to this post's comments. Not only are you a tremendous writer but you are an artist too. I love what you done with these pieces, the shells make such creative hats – I bet the ladies are listening to the sounds of the Bahama Blue sea and twirling about in front of their mirrors, laughing and singing and dreaming of the beautiful life. Your creations add some coolness and beauty to a hot and dry day here in Georgia. Thanks Gerri – love your artwork! Paula Paula – under what creative star were you born? What muse sprinkled the golden dust of artists and writers on your nose and in your brain and heart? I always stand in awe of your gifts, your talents and joie de vivre. I love who you are and what you bring to the world!